The patented steel Dual Trak Ladder is designed to provide safe, convenient access to tall shelving on both sides of narrow aisles in storage areas. A 33% increase in vertical storage space is typically achieved. The key to the Dual Trak Ladder is the overhead carriage on which the ladder is mounted. This heavy-duty carriage is mounted on dual tracks attached to shelving on both sides of the aisle. The carriage and ladder assembly rolls smoothly on these tracks along the length of the storeroom aisle. Swivel casters on the bottom of the ladder assist in this easy movement and the ladder sits firmly on rubber pad legs while in use. Additionally, the ladder rolls from side to side across the aisle on a track mounted on the carriage. 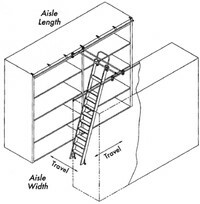 Ladder is 16" wide with a 71° climbing angle. Rolls on upper carriage and lower 2" swivel spring loaded casters. Manufactured to the desired track mounting height up to a maximum of 12' 11" and specified aisle width from 30" to 62". Maximum reaching height is 4 feet above the track level.